If all goes according to plan, patrons entering the Festival of Arts grounds next season will find the experience more user-friendly, with better situated and redesigned gallery spaces, wider garden-lined paths to access them, and more places to sit and rest along the way. These, along with rebuilding the restrooms and doubling the size of the women’s area, are among the interior renovations planned by Festival of Arts supporters and approved by the City Council on Tuesday. Architect Jay Bauer presented the plans to “restore a sense of place” to the Festival grounds by enhancing the visitor experience and trading current “relatively constricted and difficult” pathways leading to the Pageant of the Masters venue for a more easily traversed path that touches on all elements of the exhibition space as patrons make their way from the entrance to the amphitheater. Bauer, responsible for the wildly praised reworking of the Festival’s façade, described overcoming such challenges as code compliance, a six-foot grade change across the site that challenged wheelchair-bound visitors and an overburdened electrical service, among others. Festival board member Wayne Baglin ribbed the Council, saying that their utilities would be undergrounded before the canyon’s. Tencel fabric roofs will shelter art from sun and rain in the four terraced gallery spaces, the green lawn where patrons picnic and enjoy concerts will be nearer to the entry, the gift shop will be relocated and redone, and the junior art space will have a prominent location near the entrance, said Bauer. Neither a shade structure envisioned for the green nor the artist’s booths were part of the plans approved Tuesday, he said. Andy Spurlock, principal of the San Diego-based landscape architecture firm Spurlock Poirier, who partnered with Bauer Architects for the project, said most of the existing trees, with the exception of the diseased ones, including one large sycamore, will be retained. Gardens along walkways will be planted with colors of native foliage and the hardscape will be in shades of beige and light gray to relate to the canyon walls, said Spurlock. The green will remain artificial turf as it is now, the best alternative for both water conservation and high traffic, he said. While the permits approved Tuesday would allow structures to extend up to 36 feet, senior planner Wendy Jung confirmed that the overall new height, ranging between 11 and 25 feet above grade after the renovation, would be less than the current average height, with most heights reduced and some slightly higher. “This is a very soft project,” Baglin pointed out, noting that the only real intensification of use is the expanded women’s restrooms, “and I don’t think that requires more parking,” he said. 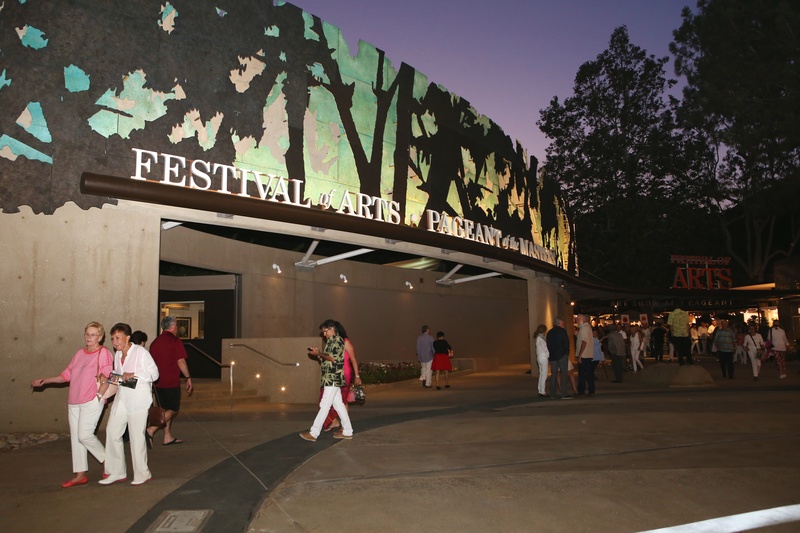 The renovated Festival will be “an asset to the community year round,” said Karen Wood, executive director of neighboring Laguna Playhouse, who added that the Arts Alliance justifiably recognized Sattler with a leadership award for his work on the project. “This is the most far-sighted, visionary board that the Festival has ever had,” agreed Mayor Pro Tem Steve Dicterow. Mayor Bob Whalen commended Jung for a stellar effort in making sure the project is legally sound and “one of the best staff reports I have seen in a long time.” He also congratulated the board for all their hard work. “Let’s move ahead and get it done,” he said.